Have you created the perfect patio or poolside retreat in your backyard? If you don’t currently have a fire pit as part of your setup, you’re missing out! It’s true that some people skip over fire pits out of concerns about safety or fear of big messes caused by wood ash and soot, but today’s popular propane and natural gas-fired pits are easy to control and virtually mess and maintenance-free. Much like your gas fireplace in your home, modern gas fire pits create a cozy feeling in your outdoor entertaining space and can be turned off and on at the flip of a switch. You don’t have to spend time and effort cleaning up after each time you’ve been enjoying them, either. Here are a few great reasons why you need to add a new gas fire pit to your patio or even your deck. At this time of year, we’re all enjoying our patios, decks, and pool areas without much thought about the coming colder seasons that will force us back indoors. Do you wish you could keep the outdoor fun going well into jacket weather? With a warm, inviting fire pit, you can. 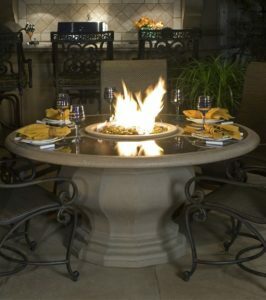 Create your fire pit with built-in seating right next to it, or explore your options for fire pit tables, which showcase a small, contained fire directly in the center of your patio dining table! No matter the format of your fire pit, the key is to have seating positioned for maximum cozying-up on chilly evenings. One of the best things about gas fire pits compared to wood-burning fire pits or plain old backyard campfires is the fact that they are so easy to live with. Natural gas and propane models are both available, which means you can build your fire pit to rely on a permanent gas line, or purchase a ready-made design powered by a standard propane tank like that you would use with your gas barbeque grill. Many raised fire pit styles and fire pit tables utilize a hidden tank, so all you see is the beauty of the fire, no matter where you place your fire pit. Do you already have an outdoor kitchen, or are you currently in the planning phases to create one of these highly desirable outdoor rooms? Fire pits are a fantastic addition to your outdoor cooking and dining spaces that add a level of comfortable or dramatic appeal sure to make your gatherings unforgettable. Place a single, large fire pit as a focal point in your outdoor dining or conversation area, choose a fun and surprising fire pit table at which to serve your guests their meal, or consider other “fire features” that delight the eye and create a special mood. Fire lanterns and “fire walls” are other examples of features that you can add instead of a fire pit, or in addition to it. 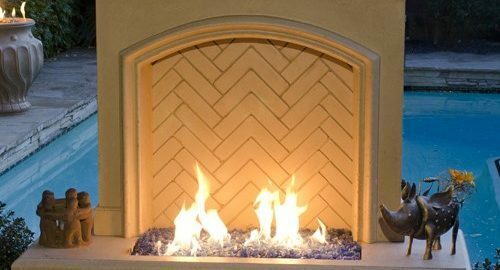 Some fire walls are designed to look like an indoor fireplace and truly make your outdoor living space an outdoor living room. 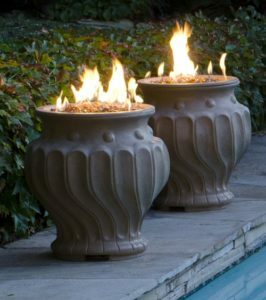 Graceful Etruscan fire urns and fire pits perched atop decorative pedestals are available, too. With so many unique options, there’s no limit to the number of fire features you can add to all of your outdoor living spaces! If you already have a gas fireplace in your home, you’re accustomed to the convenience factor presented by the gas fuel source when it comes to creating fires for ambiance and warmth. When you want to create a mood with dancing flames on the hearth, you simply flip a switch or press a button to start the fire. Gone are the days of hard labor required to create a wood fire in your home – chopping the logs, hauling the logs, inadvertently bringing dirt and bugs into your house with the logs, building the fire, and painstakingly starting the fire with matches and kindling, among other tedious steps. Banish the similar work required to create (what should be) a relaxing outdoor fire in your backyard with a gas fire pit! While it’s true that wood fires have the advantage over gas-fueled fire pits in terms of the ability to cook over them (cooking over gas fire pits is generally not recommended), you will likely find that the overall convenience of your gas fire pit will actually lead you to use it more often. And gas fire pits have significant cleanliness and safety advantages over wood-burning pits, too. First, you may not even be allowed to make wood fires on your property based on your local community or municipality rules. Wood fires present a severe risk of sparks and burning embers igniting nearby structures or grass and trees. Gas fire pits do not throw sparks in the way that burning wood does, and they’re also totally out when you flip the switch to “off,” whereas wood fires can take hours to be extinguished entirely. Before installing a gas fire pit, you’ll want to consult your local authorities for rules about backyard fires, but you will likely find decorative gas fire pits are acceptable where other types of fires are not. Rules aside, gas fire pits are even safe to enjoy on wooden decks outside your home because they are so good at keeping the fire contained and controlled. Basically, anywhere you might use your gas grill, you can typically set up a gas fire pit – the level of safety for both pieces of equipment is similar, though their purposes are different. Have we convinced you yet that gas fire pits bring more beauty and warmth to your backyard entertaining areas? If you’re not quite on board yet, we invite you to browse our inspirational fire pit gallery now. Fire pit models are available in a surprisingly wide range of price points to match the incredible variety of configurations. There’s bound to be a perfect one to fit both your style and your budget. And while custom-designed built-in fire pits tend to be more expensive, you can often incorporate the installation into a larger outdoor space renovation project, like the addition of your dream outdoor kitchen, as we talked about previously. Whether your goal is to match the aesthetics of your home exterior or create a stand-out focal point, your new gas fire pit can also be customized with colorful glass or more naturalistic-looking stone media. Or if you want your fire to give the look of burning wood, there are decorative wood-look metal sculptures, much like traditional gas fireplace log sets, available to place among the flame presentation. Gas fire pits are certainly as versatile in design options as they are beautiful, no matter what style or type you choose. When you’re ready to add a beautiful new gas fire pit, you’ll want to talk to the experts in outdoor living here at LanChester Grill & Hearth. Stop by our showroom in Gap, PA to see a range of gas fire pits on display, or contact us now to begin customizing your outdoor space with fire pits, lighting, outdoor kitchen configurations, and more. What is an Infrared Gas Grill and How Does it Work?